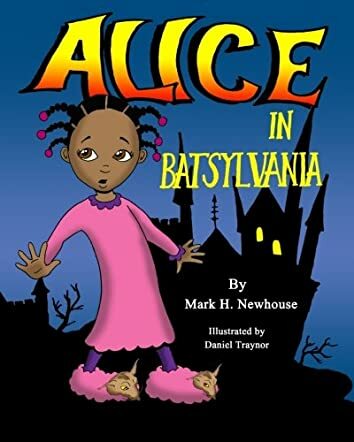 Alice in Batsylvania by Mr. Mark Newhouse is a children’s pop-up book that has thirty-four pages telling the actual story, which allows the author to tell a simple, but fairly long, tale. Each of the pages and the cover are beautifully illustrated by artist Daniel Traynor. Alice, drawn as a young African girl with braided hair, knows all the sensible rules her mother has taught her. Obviously they include “never go anywhere with a stranger,” but this is a no ordinary story so she has been forbidden to kiss bats and frogs too. The question is, will Alice stick to her mother’s rules or not? She looks like a rather mischievous little girl when she smiles from the cover, and her pink slippers have bats on them that might lead her feet astray.